Creativity challenges show up in a variety of ways. It could be designing a particular card layout, altering or re-purposing an item, or even just trying to figure out how to use a stamp set in multiple ways. 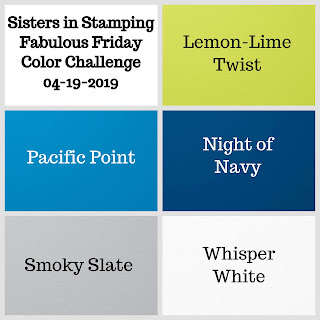 Today our challenge is represented in a color combination. Sure it seems easy enough, but truthfully it is a challenge! 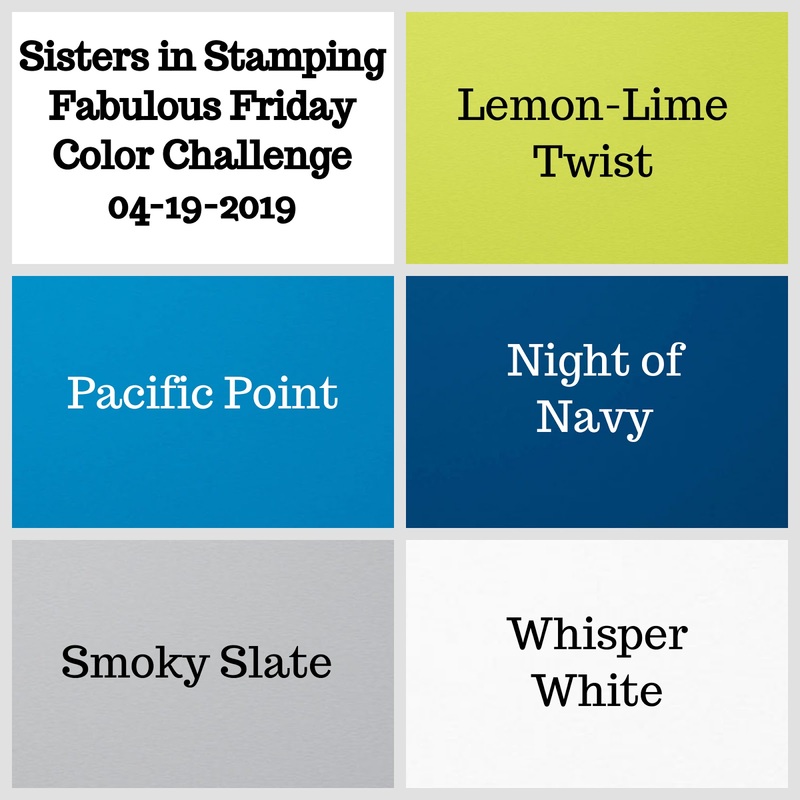 The SIS designers were given the following colors for their creations this week: Lemon-Lime Twist, Pacific Point, Night of Navy, Smoky Slate, and Whisper White. Beautiful colors independently, but stunning when used together. Debbie Naylor created a whimsical wedding card featuring the Dandelion Wishes stamp set. This is a stunning set and I think Debbie did a fantastic job using on this color challenge. Hop over to Debbie's blog here for more information. 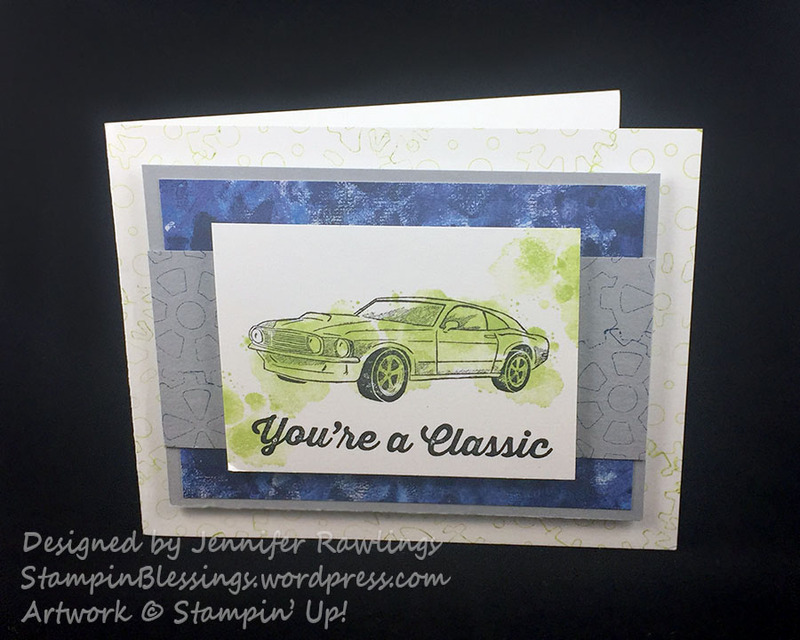 Next up is Jennifer Rawlings' card featuring the classic muscle car from the Geared Up Garage stamp set. I think it is interesting how close Jennifer's and Debbie's card layouts are this week. I suppose great minds think alike! Be sure to visit Jennifer's blog here. Before you leave, we must remind you that the Stampin' Up! retired list is posted - the closing out of these items make room for more great things in the next annual catalog. Be sure to connect with your demonstrator to place you last-chance order and get those retiring items off your wish list and in your hands before they are all gone! Thank you for visiting with us today. We pray every one of you have a blessed Easter Weekend. See you back here soon! Happy Friday and thanks for checking in this week with us! Since Easter is right around the corner we decided it is the perfect time to provide you with some inspiration for hand-stamped cards and favors. Up first is Karla Anders with this super-cute bunny bag filled with Easter candy. Be sure to check out her blog post here to find out how she made it. 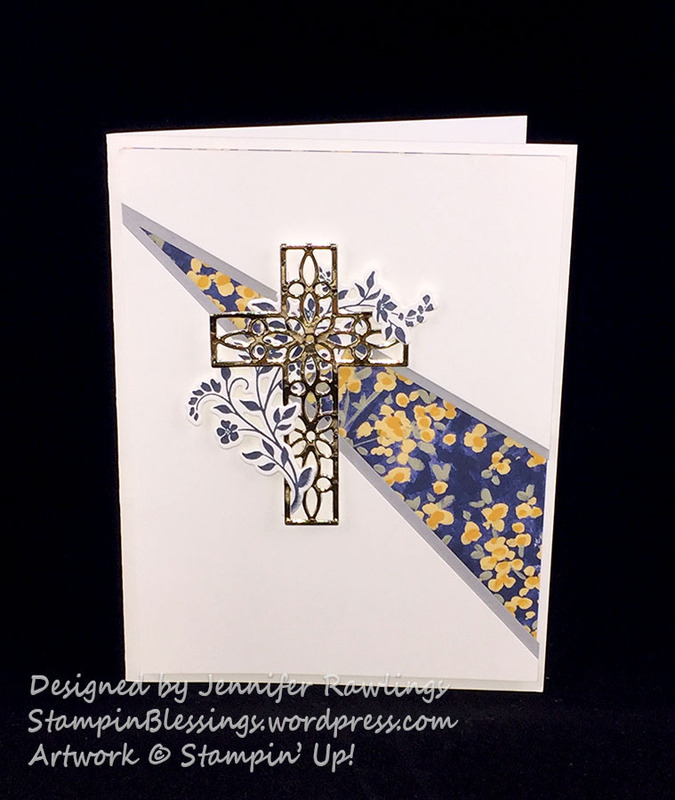 And next we have this gorgeous Easter card from Jennifer Rawlings. Please visit her blog here to get all the details about it. Last up is Debbie Naylor's bunny Easter card. Please hop over to her blog post here for more information about it. Thanks so much for visiting us this week - we hope we have inspired you and you find the time to make some hand-stamped Easter projects soon! Have a fabulous weekend!! Hello! This week the Sisters are showing cards made with the stamp set Lovely as a Tree. We think you will agree that this set has so many incredible options, it has been around forever and it is so versatile-- you'll see, just look at the samples below! Here is Debbie's donation, she made a lovely Sympathy card. Here is a link to her post for today so you can check it out. Next we have Jennifer's card, she used a unusual technique to "flower" her lovely trees. You will want to be sure to go to her blog to read about this! Lastly is Karla's lovely card. It could be a Father's Day card or even a Birthday card-- you pick! Go to her post to see more pictures. Thank-you for coming around today to see what we have to show you. 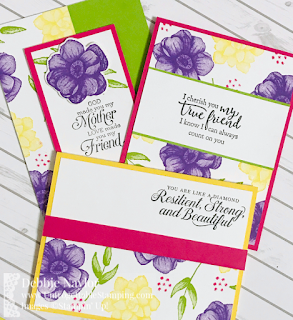 Fancy folds are one of our favorite things to do here at the Sisters In Stamping blog. This week we attempted the Bridge Fold Technique, and I think you'll love what we have to share! 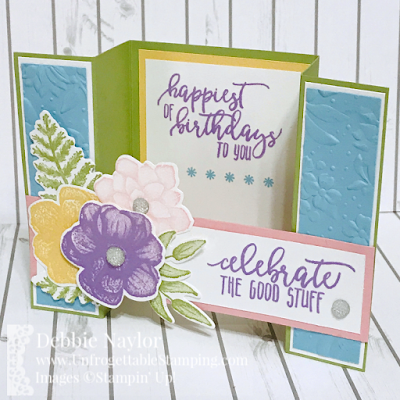 First up we have this pretty spring birthday card by Debbie Naylor. These soft colors really makes me look forward to this warmer weather. 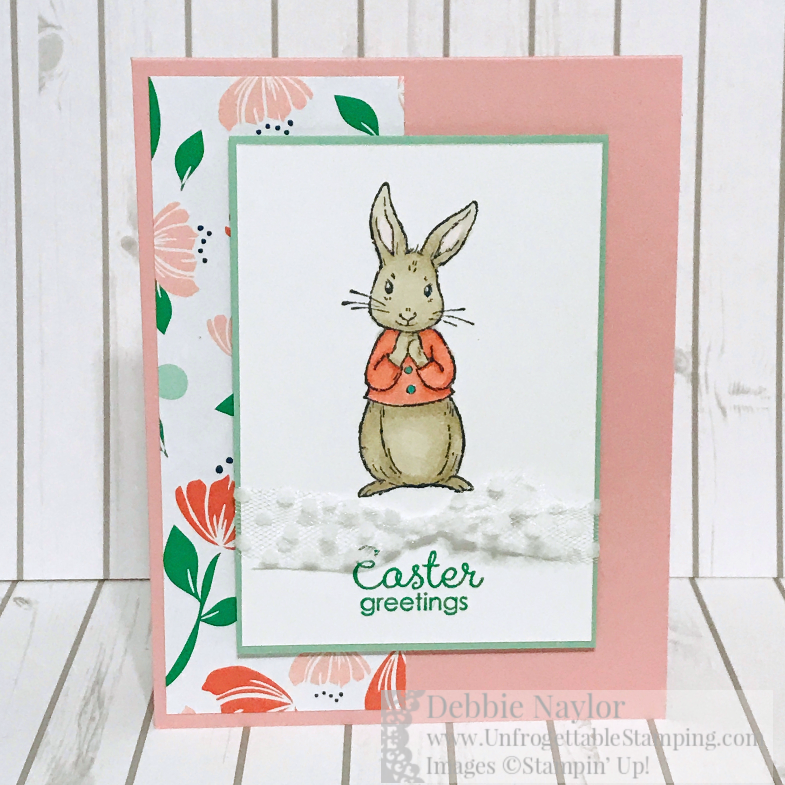 Be sure to hop over to Debbie's blog here for more details. Karla Anders gives us a reason to celebrate with this birthday cupcake card - you can almost taste the frosting! I love her color combination too. Learn all about this card by visiting Karla's blog here. 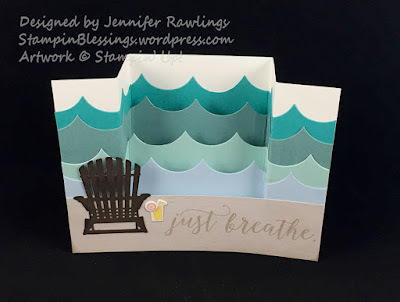 Finally, we have this beach-themed card by Jennifer Rawlings. With the additional layers, it almost feels like a grade-school diaramah! Click here to get to Jennifer's blog to see just how this project was created. Thank you for joining us today. We want to remind you that there are only a couple more days of Sale-A-Bration. Be sure to connect with your demonstrator to place your final orders and redeem your rewards! Designer Series Paper - fabulous for card making! Happy Friday and Happy Spring! We are so glad you joined us here today while we share our Fabulous Friday creations featuring Designer Series Paper (DSP). These are sold in packages sized at 12" x 12" and 6" x 6" and are so versatile since they are double-sided, giving you lots of options in a single pack. 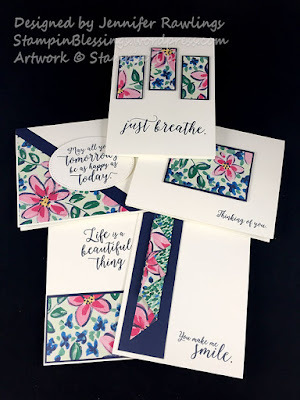 The colors all coordinate as do the designs - Stampin' Up! really takes the guess work out of using these. We hope to inspire you with our creations showing you how you can really create a WOW card when you use DSP... please read on to see what we've come up with for you this week. 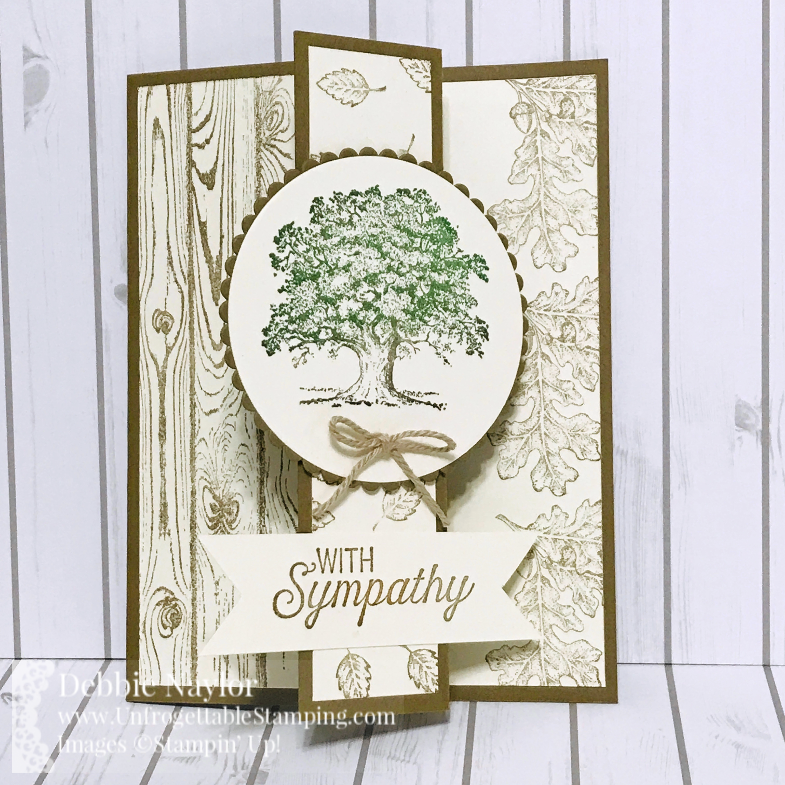 Up first is Karla Anders with her gorgeous clean and simple card. She chose to use the Botanical Butterfly DSP which is a Sale-a-Bration selection with a $50 qualifying order. You will find more information about this card here on her blog. 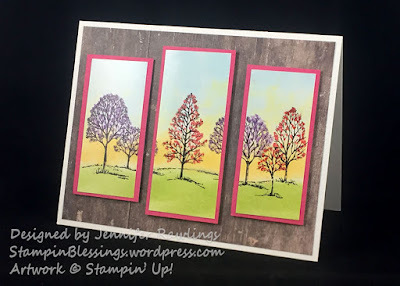 And next up is Jennifer Rawlings who designed a whole set of cards using a One-Sheet Wonder from a 6" x 6" sheet of DSP from the Garden Impressions DSP. Please be sure to visit her blog post here for more information about that. 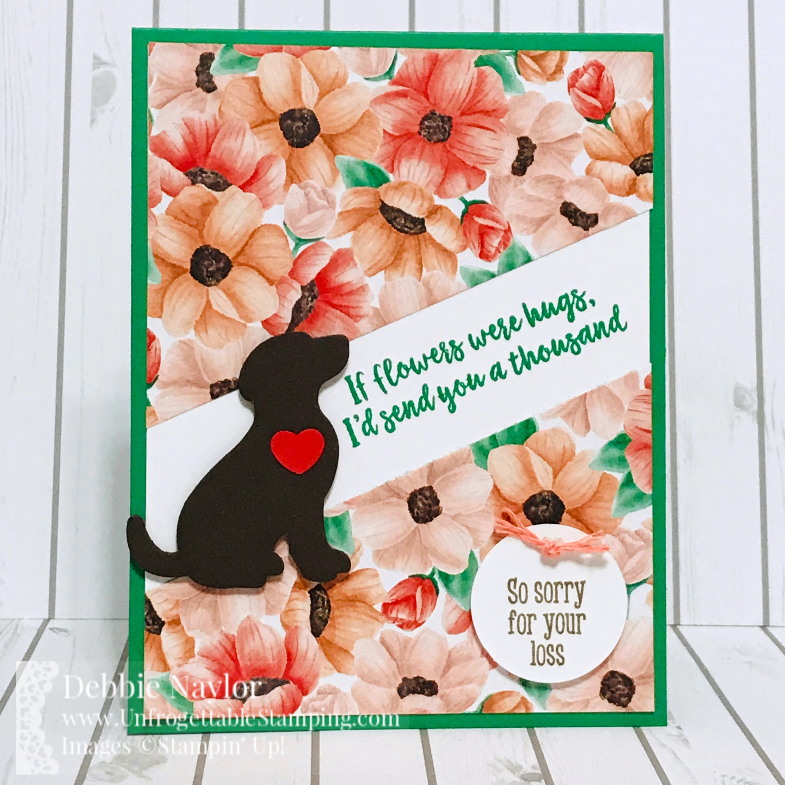 Last up is Debbie Naylor with her pet sympathy card featuring the Painted Seasons DSP that is a Sale-a-Bration selection and can be earned for free 2 ways - alone with a $50 order or with a coordinating stamp set in the Painted Seasons bundle with a $100 order. Please hop over to her blog post here for more details. Thanks, again, for stopping by. We hope our fabulous cards this week will inspire you to pull out some DSP and make some cards. Have a fabulous weekend!! 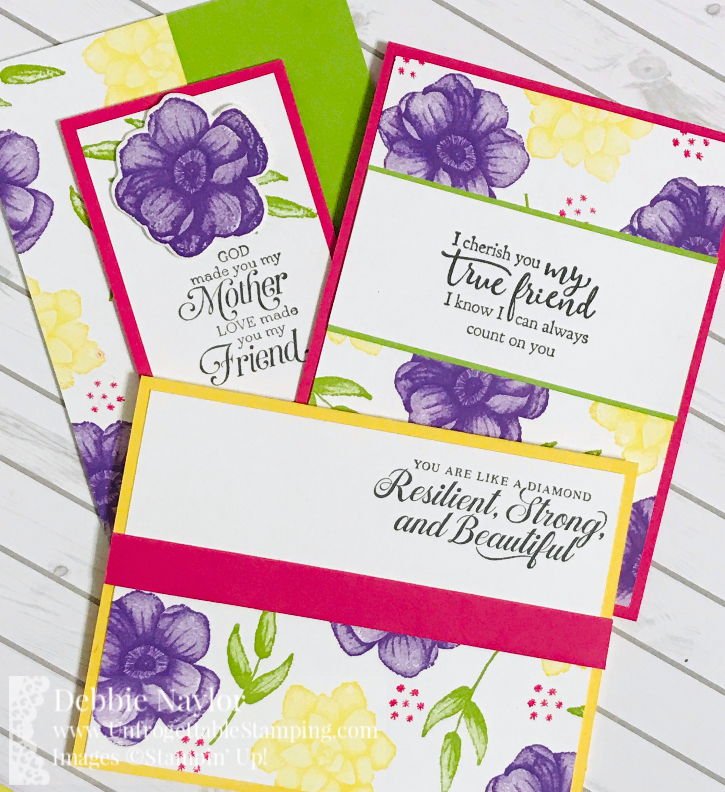 We're so excited about Sale-A-Bration this year and all of the great FREE offerings we are sharing more projects made using some of our favorite stamp sets this week. Stampin Up! 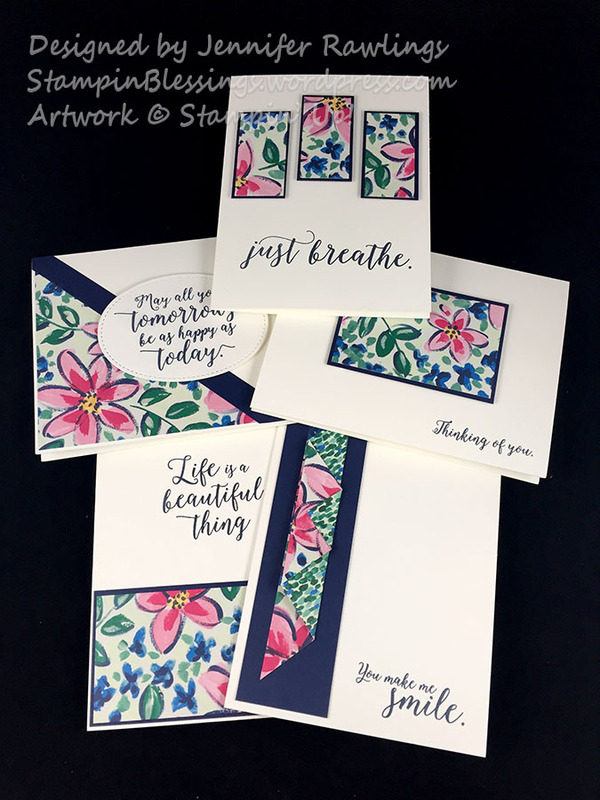 has added more Sale-A-Bration selections, contact your Demonstrator today to get a list of the new stamp sets, Designer Series Paper and other merchandise to pick from! First up is Jennifer's beautiful card. It reminds me of a quiet peaceful beach, doesn't it? 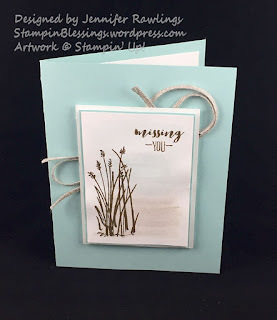 Go to her blog to read up on how she made her card. Next up is Debbie's 3 card set using one of the newest additions to the SAB line up called Painted Seasons. Her post for today has all of the information on how to make these beauties. Lastly we have Karla's card, she used the same set as Jennifer-- but, it looks completely different! Please hop on over to her blog to find out more about her project. PS. Act now, the last day of Sale-A-Bration is Monday, March 31! Hello friends! Thank you for joining us this Fabulous Friday. This week we are featuring projects for celebrating growing families, especially those with new babies! Let's see what our designers have for us today. Debbie Naylor's project is bright and cheery and absolutely stunning. 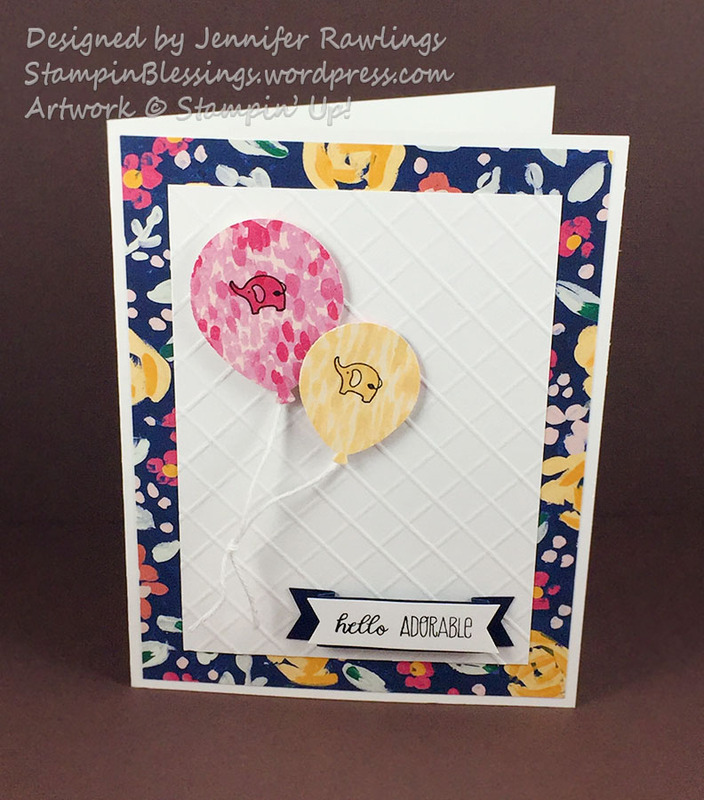 The "baby" tag featured here shows you can easily create a baby card without a baby-specific stamp set. Hope over to Debbie's blog here to learn all about her lovely project! 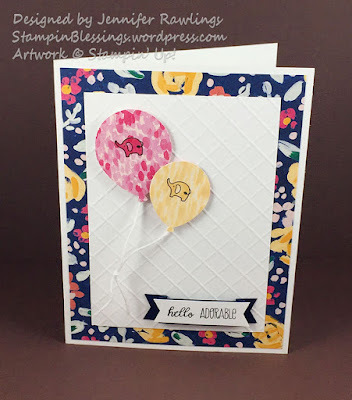 Here is a card designed by Jennifer Rawlings featuring themed party balloons - can you guess the stamp set she used? This card could easily be used as baby shower or welcome baby/congratulations family card, or even invitations! Jennifer has more information on this project at her blog here. This card by Karla Anders uses the Better Together stamp set which is absolutely perfect for today's theme. Her color combination is Sea Foam and Highland Heather, a soft selection and beautifully coordinated. Please stop over to Karla's blog here to see more. Thanks for joining us again and being a part of our growing "family." Be sure to visit us often, invite your friends to come along, and take a trip to our personal blogs as well.